We are in the final stages of our regional meetings, with the Coral Sea Panel preparing for their visits in the coming week to Mooloolaba (7-8 April) and Brisbane (9-10 April). We have now been to 12 locations around Australia covering the four regions (Temperate East, South-west, North-west and North) and held 7 multi-sector forums and approximately 140 smaller individual meetings. We are finding a lot of common ground in our discussions. Many of those we have spoken to broadly accept the reserves network. That said we have encountered a number of issues and concerns that will need resolution. Discussions to date have been very constructive around these areas of concern and have provided good ideas and a range of options about how to address them. We have heard and seen a genuine willingness from stakeholders to collaborate to find workable solutions. As a result of our regional meetings, we have a clearer picture of the range of opportunities that should improve the environmental, social and development outcomes. We have now passed the closing date for submissions and have been encouraged by the response that we have received from all the stakeholders. In the four month submission period (between 28 November 2014 and 31 March 2015) we received over 13 000 written submissions and more than 1800 survey responses. As we complete all of the regional meetings our attention is shifting to evaluating the feedback from our meetings, written submissions and the online survey. We have also made several references to the Expert Scientific Panel arising from issues raised in the regional consultations of the Bioregional Advisory Panels. We anticipate further targeted meetings with stakeholders as we work on finding solutions to the concerns raised. Please contact the Review Secretariat via email (cmrreview@environment.gov.au) if you have any questions or queries about consultation in your region. The Australian Government has committed to a review of emissions reduction targets in 2015. The review is part of Australia’s preparations for the UNFCCC Paris Conference in December 2015, where negotiations on a new global climate agreement will conclude. The UNFCCC Taskforce in the Department of the Prime Minister and Cabinet has been established to coordinate the review. The taskforce is working closely with the Departments of Foreign Affairs and Trade, Industry and Science, the Environment and the Treasury. Further information on UNFCCC negotiations can be found at the Department of Foreign Affairs and Trade website. For information on action Australia is already taking on climate change, please see the Department of the Environment’s website. The Prime Minister, together with the Ministers for Foreign Affairs and the Environment, announced a public consultations process on Australia’s post-2020 emissions reduction target on 28 March 2015. The Australian Government values the views of the Australian community. You are invited to submit your views on Australia’s post-2020 emissions reduction target. To assist you in writing your submission, this issues paper briefly outlines the context in which the Government is considering post-2020 emissions reduction targets for Australia. Additional information about the UNFCCC preparations for a new global climate agreement can be found in the accompanying fact sheet and links tobackground information. Information on how you can make a submission. Submissions open Saturday 28 March 2015 and close 3pm AEST Friday 24 April 2015. Last week, news emerged about a great conservation breakthrough in the Kimberley. The news was hard to believe! Two of the world’s largest mining companies, Rio Tinto and Alcoa, had decided to hand back bauxite mining leases – which threatened the spectacular Mitchell Plateau. This enabled the Western Australian Government to proceed with plans to create Australia’s largest national park. This was an extraordinary achievement that speaks to the power of people to stop economic self-interest from prevailing over the natural world. Wilderness Society campaigners and members, together with other environmentalists and Traditional Owners, have campaigned since the 1980s to protect the Mitchell from bauxite mining. This is a great outcome of which we should all be proud. After decades of hard work, the Mitchell Plateau is on track to become part of Australia’s largest national park. This region is home to some of our most iconic and breathtaking landscapes, including the stunning Mitchell falls, ancient rock art and a rich diversity of plants and animals. This decision was made possible by Rio Tinto and Alcoa handing back their mining licences to the WA Government. Analysis of 20 years of satellite data has revealed the total amount of vegetation globally has increased by almost 4 billion tonnes of carbon since 2003. This is despite ongoing large-scale deforestation in the tropics. An Australian-led international team of scientists published the findings in Nature Climate Change, finding a range of causes for the increase. "The increase in vegetation primarily came from a lucky combination of environmental and economic factors and massive tree-planting projects in China," said Dr Yi Liu a lead author and remote sensing scientist from the Centre of Excellence for Climate System Science at the University of New South Wales. "Vegetation increased on the savannas in Australia, Africa and South America as a result of increasing rainfall, while in Russia and former Soviet republics we have seen the regrowth of forests on abandoned farmland. China was the only country to intentionally increase its vegetation with tree planting projects." At the same time massive vegetation loss is still occurring in many other regions. The greatest declines have been on the edge of the Amazon forests and in the Indonesian provinces of Sumatra and Kalimantan -- the Indonesian part of Borneo. To get their results the team pioneered an entirely new technique to map changes in vegetation biomass over time, using satellite measurements of natural radio waves emitted from the Earth's surface. 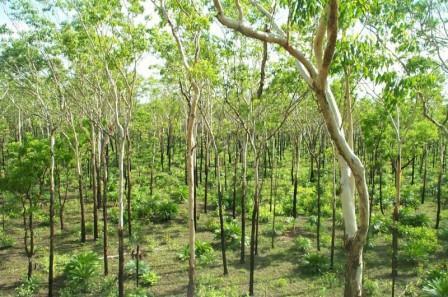 "Previous analyses of vegetation biomass focused on forest cover change," said fellow lead author, Professor Albert van Dijk of The Australian National University. "With our approach we found unexpectedly large vegetation increases in the savannas of southern Africa and northern Australia. The increase in Australia occurred despite ongoing land clearing, urbanization and big droughts across other parts of Australia." The increased greening means the total amount of carbon captured in Australia's vegetation has increased. The main cause of this strong growth over the savannas came from higher rainfall, particularly in recent years, although higher levels of CO2 in the atmosphere may have helped plants there to grow more vigorously. "It's important to recognize that global warming would be happening faster if some of our CO2 emissions were not captured by this vegetation growth." But even with the good news of nature helping regulate Earth's climate, Dr Canadell said there was still only one way to reduce the impacts of global warming. "We know about 50% of emissions from human activities stay in the atmosphere even after the other half is removed by terrestrial vegetation and oceans. The only way to stabilize the climate system is to reduce global fossil fuel emissions to zero." April 1, 2015 – A common growth-promoting hormone used worldwide in the cattle industry has been found to affect the sexual behaviors of fish at a very low concentration in waterways -- with potentially serious ecological and evolutionary consequences.Researchers from Monash University, Australia in collaboration with researchers from Åbo Akademi University in Finland, have found that the steroid 17β-trenbolone -- used on livestock to increase muscle growth -- alters male reproductive behavior in guppy fish (Poecilia reticulata). This androgenic growth promoter is part of a group of contaminants called endocrine disrupting chemicals (EDCs) that enter the environment through a variety of sources -- from discharge of household waste to agricultural run-off and industrial effluent. "Endocrine disrupting chemicals (EDCs) are cause for concern given their capacity to disturb the natural functioning of the endocrine (hormonal) system, often at very low concentrations, with potentially catastrophic effects. Research until now has focussed primarily on the morphological and physiological effects of EDC exposure. For the first time, our research has shown that exposure to an environmentally realistic concentration of 17β-trenbolone -- just 22 nanograms per litre -- is sufficient to alter male reproductive behavior." The research shows that exposure of guppy fish to 17β-trenbolone influences the ratio of male courtship (where the female chooses her mate) to forced copulatory behavior (sneaking), whereby the female is inseminated internally from behind and does not choose her mate. 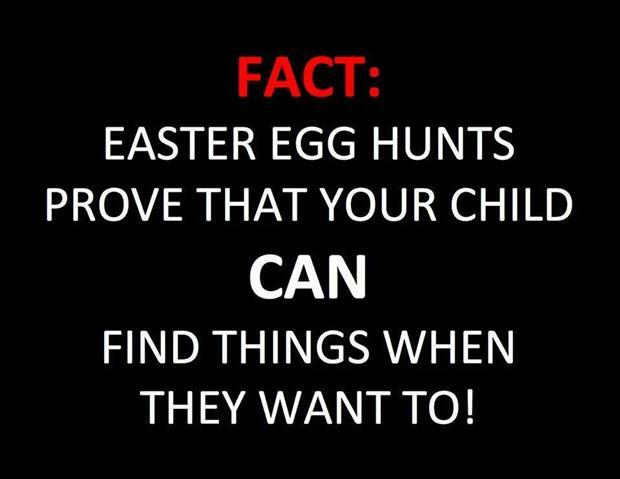 The results of her research indicated a marked increase in sneaking behavior. "By influencing mating success, sexual selection can profoundly affect individual populations and species, with potentially devastating long term evolutionary and ecological impacts," Saaristo said. Saaristo said that by illustrating the capacity of the agricultural contaminant to alter reproductive behavior, the research demonstrated the possibility of widespread disruption of mating systems in wild populations. The research was published in the journal Hormones and Behavior. With terrestrial vegetation removing about a quarter of the carbon emissions from human activities and the global oceans removing another quarter, this means that half of our CO2emissions remains in the atmosphere. Therefore, stabilising concentration of CO2 in the atmosphere and the consequent impact on the climate system will still require large reductions of global fossil fuel emissions. BIBY TV welcomes short duration bird footage contributions from Australia's community - young and old, far and wide across our country. This video shows what is possible using a GoPro HERO4, Wi-Fi and the GoPro app on an Android tablet. The NSW National Parks and Wildlife Service (NPWS) is encouraging all families to get outdoors these school holidays to enjoy a nature walk together in a beautiful national park. Some of the best nature walks in NSW have been shortlisted by NPWS and their visitors, and include a selection of short and easy walks for families. With the Easter school holidays here and the arrival of autumn’s lovely weather, it’s the perfect time for families to pack a picnic and set out on a relaxing walk along unspoilt coastline, rainforest boardwalks and more. A walk in nature is a healthy and inexpensive holiday activity for the whole family, and provides opportunities for kids to be active, have fun and learn about nature in the great outdoors. 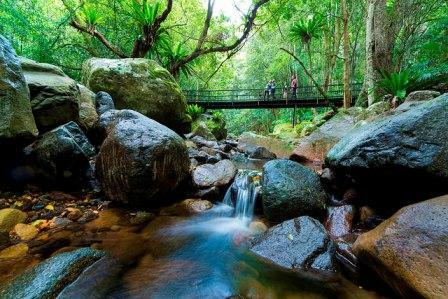 • The Falls Walk Starting at the Minnamurra Rainforest Centre, this easy walk in Budderoo National Park has an elevated walkway and paved track providing spectacular rainforest, waterfall and canyon views from several viewing platforms. Walkers can take in the lush beauty of trickling streams, moss-covered rocks and feathered ferns, and kids can spot butterflies, animals and the local lyrebirds. After an enjoyable rainforest walk, relax over lunch at the nearby picnic area or enjoy a snack from the café at Minnamurra Rainforest Centre. • Hyams Beach trail This easy, scenic walk in Jervis Bay National Park starts at the southern end of Hyams Beach village, and takes walkers to the beautiful Seamans Beach. Kids will love seeing the local Jervis Bay birdlife including new holland honey-eaters, eastern spinebills, eastern rosellas, and crimson rosellas. The nearby family-friendly Greenfield picnic area is perfect for families to enjoy a barbeque, or set out on the longer White Sands walk and Scribbly Gum track. This walk passes pristine white sandy beaches and provides stunning bay views. • how to improve community involvement in the reserve establishment process. The Australian Government has released a consultation paper on the review of the National Carbon Offset Standard (NCOS) and the Carbon Neutral Program. The NCOS provides companies the opportunity to voluntarily offset their carbon emissions and gain Government approved carbon neutral certification under the Carbon Neutral Program. The NCOS helps businesses to calculate their carbon footprint or to develop carbon neutral products. It also assists consumers to make informed choices about carbon neutral products or services. The Carbon Neutral Program, based on the NCOS, provides a way for businesses and other organisations to gain carbon neutral certification for their operations, products, services or events. A diverse range of companies have chosen to become carbon neutral, including airlines, banks, councils and small businesses. Certified companies such as Qantas, ANZ, and Melbourne City Council offset around 1 million tonnes of emissions per annum under the Carbon Neutral Program. The Government committed to review the NCOS as part of the Emissions Reduction Fund development in 2014 to ensure continuing integrity of the carbon offsets available to the Australian voluntary market and to improve uptake. As part of the review, the government is seeking feedback on opportunities to broaden involvement in carbon neutral certification, including identifying certification models and making sure the eligible offsets list is up to date with the broader voluntary market. The NCOS complements the Government's Direct Action Plan with the $2.55 billion Emissions Reduction Fund as its centrepiece. Carbon Neutral Program participants have the opportunity to purchase ACCUs (Australian Carbon Credit Units) under the ERF including in projects such as savanna burning often done by Indigenous communities, environmental tree plantings and waste diversion activities. The review is being conducted by the Department of the Environment in consultation with key stakeholders and the public. Businesses, community organisations and individuals are invited to make submissions on the consultation paper by 5pm AEST 22 April 2015. 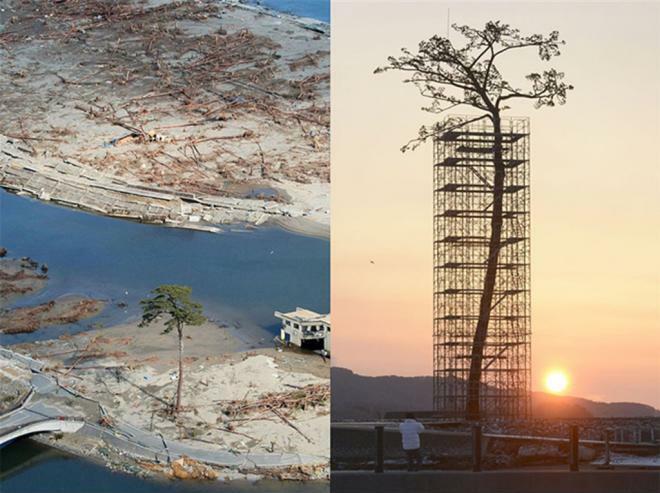 The only tree that survived the tsunami in Japan between 70,000 trees. Today protected and restored. The Green Army will reach another major milestone this week with 54 new projects starting work, bringing the total number of projects underway or completed to 165. We committed to delivering 250 projects on the ground in the first year of the Green Army and we are on track to significantly exceed that target. We are well ahead of schedule. Projects that have been completed have delivered impressive results not only for the local environment, but also for the young participants involved. The Green Army provides young people across the country with a chance to take part in important environmental and conservation activities, while at the same time receiving training and qualifications. Green Army participants receive an allowance, training in first aid, and are eligible to gain Certificate I or II qualifications in areas such as land management, park management, landscaping or horticulture or nationally endorsed skills set to support them in their future career prospects. We continue to hear positive stories of Green Army participants finding employment in environmental fields, or going on to become Project Supervisors in other Green Army projects. The Green Army is making a real difference to the environment and local communities, and it will continue to grow over time. Bangalley Head stands as the highest point and one of Pittwater’s largest bushland reserves on its clifftop coast line. This - together with the great variety of native plants in the reserve and beautiful ocean views - makes Bangalley Head a haven for bushwalkers and wildlife alike. Native birds and marsupials - such as ringtail possums, honeyeaters, spinebills, finches and wrens - feed, breed and shelter among the dense thickets of coastal scrub and pockets of rainforest plants. This is a fun event for all the family and a great opportunity to lean more about our amazing flora and fauna! March 30, 2015 – A 30-foot-long core sample of Pacific Ocean seafloor is changing what we know about ocean resiliency in the face of rapidly changing climate. A new study reports that marine ecosystems can take thousands, rather than hundreds, of years to recover from climate-related upheavals. The study's authors--including Peter Roopnarine, PhD, of the California Academy of Sciences--analyzed thousands of invertebrate fossils to show that ecosystem recovery from climate change and seawater deoxygenation might take place on a millennial scale. The revolutionary study is the first of its kind, and is published today in the Early Edition of the journal PNAS. The scientific collaborative--led by Sarah Moffitt, PhD, from the UC Davis Bodega Marine Laboratory and Coastal and Marine Sciences Institute--analyzed more than 5,400 invertebrate fossils, from sea urchins to clams, within a sediment core from offshore Santa Barbara, California. "In this study, we used the past to forecast the future," says Roopnarine, Academy curator of invertebrate zoology and geology. "Tracing changes in marine biodiversity during historical episodes of warming and cooling tells us what might happen in years to come. We don't want to hear that ecosystems need thousands of years to recover from disruption, but it's critical that we understand the global need to combat modern climate impacts." The tube-like sediment core is a slice of ocean life as it existed between 3,400 and 16,100 years ago, and provides a before-and-after snapshot of what happened during the last major deglaciation--a time of abrupt climate warming, melting polar ice caps, and expansion of low oxygen zones in the ocean. The new study documents how long it has historically taken for ecosystems to begin recovery following dramatic shifts in climate. Previous marine sediment studies reconstructing Earth's climatic history rely heavily upon simple, single-celled organisms called Foraminifera. This week's study explores multicellular life--in the form of invertebrates--in pursuit of a more complete picture of ocean ecosystem resilience during past periods of climate change. "The complexity and diversity of a community depends on how much energy is available," says Roopnarine. "To truly understand the health of an ecosystem and the food webs within, we have to look at the simple and small as well as the complex. In this case, marine invertebrates give us a better understanding of the health of ecosystems as a whole." Moffitt emphasized the importance of using a large, 30-foot core sample from one portion of the seafloor, saying the team "cut it up like a cake" to analyze the full, unbroken record. The study results suggest that future periods of global climate change may result in similar ecosystem-level effects with millennial-scale recovery periods. As the planet warms, scientists expect to see much larger areas of low-oxygen "dead zones" in the world's oceans. "Folks in Oregon and along the Gulf of Mexico are all-too-familiar with the devastating impacts of low-oxygen ocean conditions on local ecosystems and economies," says Roopnarine. "We must explore how ocean floor communities respond to upheaval as we adapt to a 'new normal' of rapid climate change. We humans have to think carefully about the planet we are leaving for future generations." April 1, 2015 – A team of scientists led by the U.S. Geological Survey found that polar bears, increasingly forced on shore due to sea ice loss, may be eating terrestrial foods including berries, birds and eggs, but any nutritional gains are limited to a few individuals and likely cannot compensate for lost opportunities to consume their traditional, lipid-rich prey -- ice seals. "Although some polar bears may eat terrestrial foods, there is no evidence the behavior is widespread," said Dr. Karyn Rode, lead author of the study and scientist with the USGS. "In the regions where terrestrial feeding by polar bears has been documented, polar bear body condition and survival rates have declined." The authors detail their findings in a review article inFrontiers in Ecology and the Environment. The scientists noted that over much of the polar bear's range, terrestrial habitats are already occupied by grizzly bears. Those grizzly bears occur at low densities and are some of the smallest of their species due to low food quality and availability. Further, they are a potential competitor as polar bears displaced from their sea ice habitats increasingly use the same land habitats as grizzly bears. "The smaller size and low population density of grizzly bears in the Arctic provides a clear indication of the nutritional limitations of onshore habitats for supporting large bodied polar bears in meaningful numbers," said Rode. "Grizzly bears and polar bears are likely to increasingly interact and potentially compete for terrestrial resources." The study found that fewer than 30 individual polar bears have been observed consuming bird eggs from any one population, which typically range from 900 to 2000 individuals. "There has been a fair bit of publicity about polar bears consuming bird eggs. However, this behavior is not yet common, and is unlikely to have population-level impacts on trends in body condition and survival," said Rode. Few foods are as energetically dense as marine prey. Studies suggest that polar bears consume the highest lipid diet of any species, which provides all essential nutrients and is ideal for maximizing fat deposition and minimizing energetic requirements. Potential foods found in the terrestrial environment are dominated by high-protein, low-fat animals and vegetation. Polar bears are not physiologically suited to digest plants, and it would be difficult for them to ingest the volumes that would be required to support their large body size. "The reports of terrestrial feeding by polar bears provide important insights into the ecology of bears on land," said Rode. "In this paper, we tried to put those observations into a broader context. Focused research will help us determine whether terrestrial foods could contribute to polar bear nutrition despite the physiological and nutritional limitations and the low availability of most terrestrial food resources. However, the evidence thus far suggests that increased consumption of terrestrial foods by polar bears is unlikely to offset declines in body condition and survival resulting from sea ice loss." in 2014, Nature reporter Jeff Tollefson travelled to the Brazil to report on the mass deforestation of the Amazon. This Nature Video tells the stories of the people he met along the way. 1 April 2015 - A world first study revealing the presence of two antibodies in a sub-group of children experiencing their first episode of psychosis affirms a longstanding recognition that auto-immune disorders play a significant role in psychiatric illness. Antibodies defend the body against bacterial, viral, and other invaders but sometimes the body makes antibodies that attack healthy cells. In these cases, autoimmune disorders develop. These include conditions such as multiple sclerosis (MS), rheumatoid arthritis and Type 1 diabetes. This 'immune hypothesis' is supported by new research in the current issue of Biological Psychiatry. Researchers from the Kids Research Institute at the Children's Hospital, Westmead, and the University of Sydney detected antibodies to the dopamine D2 receptor or the N-methyl-D-aspartate (NMDA) glutamate receptor among eight out of 43 children experiencing their first episode of psychosis, but no such antibodies in healthy children. Both are key neural signaling proteins previously been implicated in psychosis. "The antibodies we have detected in children having a first episode of acute psychosis suggest there is a distinct subgroup for whom autoimmunity plays a role in their illness," says the University of Sydney's Dr Fabienne Brilot, the senior author on the paper and Head of the Neuroimmunology Group at The Children's Hospital at Westmead in Sydney. "The finding suggests that better interventions are possible, providing hope that major disability can be prevented for the subset of children experiencing acute psychosis with antibodies," Brilot adds. Dopamine is a chemical messenger aiding the transmission of signals in the brain and other areas of the body. Regulating its actions plays a crucial role in mental and physical health. Dopamine acts on receptors tailored specifically for it. The dopamine-2 receptor (D2R) is one of five subtypes of mammalian dopamine. Increasing knowledge of the roles of dopamine receptor subtypes raises the hope that more selective drugs will be developed. Abnormalities in dopaminergic neurotransmission play a key role in the pathogenesis of psychosis. Many drugs affect dopamine transmission directly by either blocking or stimulating its receptors. Many antipsychotics show varying affinities for the different dopamine receptors but blockade of the dopamine-2 receptor (D2R) specifically has proved to be indispensable in the clinical management of psychosis. While less well established than dopamine, it is also likely that glutamatergic dysfunction also plays a role in psychotic disease. This suggests that specific pathologies and processes affecting D2R and the glutamatergic N-methyl-D-aspartate receptor (NMDAR) could define biological subgroups and may be involved in the pathogenesis of psychosis and other psychiatric illnesses such as schizophrenia. "There is a pressing need in psychiatry to establish biologically based disease subtypes, which might allow for more specific diagnosis and effective intervention," says Dr Brilot. "Our findings contribute further understanding of the biology of psychiatric and neurological diseases and whether autoantibodies detected in a subgroup of patients can trigger psychiatric disorders. "Further research will reveal whether these antibodies are the mark of a clinically relevant subset of patients and, if so, whether immunosuppressive therapies can effectively treat children with these debilitating illnesses." Using previously top secret technology, Prof Melissa Knothe Tate and her team at UNSW Biomedical Engineering are zooming in and out of the human body right down to single cells, just as you would with Google maps. Starting with the knee joint, the researchers can figure out how cells behave and impact on conditions like osteoarthritis. UNSWTV is the official channel of UNSW Australia (the University of New South Wales), a powerhouse of cutting-edge research and teaching in the Asia-Pacific based in Sydney. Innovation, technology and creativity are at the heart of what we do. UNSW is recognised as the Australian university with the strongest links to industry and claims the largest proportion of alumni in top CEO positions. With more than 50,000 students from more than 120 countries, we also have one of the most diverse student populations. March 30, 2015 - Applying ice to a muscle after injury is a commonly prescribed therapy for treating muscle bruises. But does it really speed recovery time and help the muscle to heal? Researchers from the Institute of Health and Biomedical Innovation at Queensland University of Technology in Australia investigated whether icing after a muscle impact injury contributed to new blood vessel formation (angiogenesis) and muscle regeneration. The research team looked at two groups of rats with thigh contusions. One group received ice within five minutes of injury for 20 minutes. The second group received no ice. During the acute phase three days after injury, infiltration of inflammatory cells and the markers of angiogenesis -- vascular endothelial growth factor (VEGF) and von Willebrand factor (vWF) -- were lower in the icing group compared with the non-icing group. During the early repair phase (seven days), inflammatory cell numbers were higher, while VEGF and vWF expression remained lower, in the icing group compared with the non-icing group. In the late repair phase (28 days), inflammatory cell numbers, VEGF expression and the number of regenerating muscle fibers were all greater in the icing group (causing less inflammation and swelling) compared with the non-icing group. Muscle fiber cross-sectional area was similar between the groups at seven and 28 days after injury. Despite popular belief, inflammation can be an important process in tissue regeneration. The results suggest that ice may delay inflammation, angiogenesis and the formation of new muscle fibers during recovery from severe muscle injury. "These findings challenge the practice of using ice to treat muscle injuries," the research team wrote. Practitioners should therefore reconsider how they use treatments such as icing and non-steroidal anti-inflammatory drugs to manage acute soft tissue injuries. The above story is based on materials provided by American Physiological Society (APS). L to R Dr Stuart McGill, Prof Trevor Hambley, Prof Diane Mayer, Ian MacFarlane MP, Prof Stephen Garton, Prof Archie Johnston, Prof Ian Chubb at the official launch. Last night Professor Ian Chubb, the Chief Scientist, gave an official address at the opening of the STEM Teacher Enrichment Academy at the University of Sydney, the first of its kind in Australia. STEM refers to science, technology, engineering and mathematics. A recent Australian Industry Group report forecast STEM job demand — ranging from mining engineers to chemists, software programmers to agricultural scientists — to grow at almost twice the pace of other occupations. "To meet this need we want to give teachers nationally from both metropolitan and regional schools the best possible support, resources and skills to encourage their students to participate in STEM as the first step in pursuing related careers," said Associate Professor Judy Anderson, acting director of the Academy, from the Faculty of Education and Social Work. Australian Minister for Industry and Science Ian Macfarlane said STEM skills are central to building Australia's productivity. "The Australian Government has put science at the centre of our industry policy because science and research are vital to boosting the economy and supporting quality of life improvements for all Australians," Mr Macfarlane said. "We must inspire the next generation of scientists and ensure that our graduates have both the academic foundations and the best practical skills to succeed in business or industry." The Academy is the brainchild of anonymous donors, who gave $5 million to make it possible. They were inspired to encourage young people to consider advanced STEM skills as vital to their future prospects. "They had seen how in-service training of teachers overseas had been successful; they recognised a need in Australia, and knew we could make it work here too. They decided that the University of Sydney - with our tradition of excellence in training teachers - is just the place to do it and we are honoured to be able to realise their vision," said Dr Michael Spence, Vice-Chancellor and Principal of the University of Sydney. The Academy draws on expertise from three of the University's faculties. The Faculty of Education and Social Work, provides outstanding expertise in teaching and learning; the Faculty of Science offers its experience and understanding of recent developments in science; the Faculty of Engineering and Information Technologies helps teachers incorporate real-world problem solving examples into their teaching. "In collaboration with highly-experienced teachers and principals advising the Academy we are perfectly positioned to contribute to the future of STEM education," said Associate Professor Anderson. The academy's flagship is a multi-day residential program for up to 60 teachers of year 7-10 mathematics, science and technology. The average high school teacher looks after approximately five classes, so the program has the potential to influence more than 80,000 students in its first five years. The Academy also offers new teachers professional development and mentoring to become STEM ambassadors. In the USA, the NASA Pre-Service Teacher Institute has had outstanding success with this model. All teachers participating in the Academy will also have ongoing access to an online centre providing events, advice and resources. NBN Co has today launched commercial fibre-to-the-basement (FTTB) products, following a pilot program showing superfast speeds can be delivered. The technology allows the NBN Co to deploy superfast broadband sooner and at less cost to homes and business which are in apartment- or office-blocks. Under the fibre-to-the-basement pilot, the NBN Co has achieved average speeds of 89 megabits per second download and 36 megabits per second upload. That would allow a premises to stream around 18 high definition television streams concurrently. They can also access other bandwidth intensive applications such as video conferencing and cloud computing. Communications Minister Malcolm Turnbull said that the use of the technology would give NBN Co more flexibility in delivering superfast broadband as the company transitions to a Multi-Technology Mix rollout. "NBN Co recommended to Labor that it should be allowed to deploy fibre-to-the-basement, because of the difficulties it experienced in connecting apartment blocks and office blocks when it was required to provide fibre going into every premise," he said. "That advice was ignored. And yet in nearly every market where there's a high penetration of fibre connections, such as in Japan and Korea, deploying fibre-to-the-basement is the norm". NBN Co's 2014-17 Corporate Plan indicates that 1.4 million premises around Australia will be connected to the National Broadband Network via fibre-to-the-basement and fibre-to-the-distribution-point. To date, NBN Co has to date passed 18 buildings with its fibre-to-the-basement architecture, and around 2,000 premises are now ready for service. NBN Co is targeting around 90,000 homes and businesses to be ready for service by the end of the 2015 calendar year. The Australian Bureau of Statistics (ABS) today released their 2013 report on causes of death in Australia. The report looks at the 147,678 deaths reported in 2013 and presents a full picture of mortality patterns across the Australian population. "Heart disease remains the leading cause of death in Australia, accounting for almost 20,000 deaths in 2013," said James Eynstone-Hinkins from the ABS. "However, deaths from Dementia and Alzheimer's disease have been increasing in number for many years, and now outrank Cerebrovascular diseases as the second leading cause of death of Australians. "There were 11,000 deaths from Dementia and Alzheimer's in 2013, an increase of over five per cent in the past year and over 30 percent in the past five years. "Advancements in treatment of circulatory diseases have decreased the number of deaths from these conditions. As life expectancy increases (now at 80.1 years for males and 84.3 years for females) it is likely the number of deaths from dementia will continue to grow. "These large scale shifts in patterns of mortality provide critical insights into the multitude of factors which impact on the health of Australians. "Cancer deaths have also outnumbered deaths from circulatory diseases for the first time in 2013. "There were over 8,000 Australians who died from lung cancer in 2013, a 13 per cent increase since 2004. Colon cancer, blood cancers, prostate, breast, pancreatic and skin cancers were all among Australia's 20 leading causes of death." The report found there were more male deaths than female deaths in 2013 (75,782 and 71,896 respectively) and some key differences in leading causes. "Among females, lung cancer caused 3,222 deaths making it the fifth leading cause. Dementia and Alzheimer's was the second leading cause for females accounting for 7,277 deaths, compared to only 3,656 deaths among males. Suicide was once again the leading cause of death for Australian's aged 15 to 44. Suicide accounted for 2,520 deaths in 2013 at a standardised death rate of 10.7 per 100,000 people. The median age at death for suicides is lower than for many other causes at 44.5 years of age. As a result, suicide accounted for over 85,000 years of life lost making it the leading cause of premature death in Australia. The Australian Government today announced the organisations selected to be part of its new employment services system, to be known as jobactive. From 1 July 2015, there will be 66 organisations delivering one or more jobactive services to job seekers and employers across Australia. Minister for Employment Senator Eric Abetz said the Government is investing $5 billion over three years to replace Labor’s failed Job Services Australia system and improve the quality of services delivered. “The Coalition Government introduced the contracted model of employment services in 1998, as it provides better value for taxpayers’ money and ensures job seekers have access to the services they need right around the country,” Senator Abetz said. “Unfortunately, under Labor the employment services system was changed to reward process over results, training for training’s sake and had become mired in red tape. “This has let down job seekers and employers, and reduced public confidence in employment services. “Last year the Government reduced the red-tape burden and commenced a formal tender process to strengthen and reinvigorate employment services after years of Labor’s neglect. The new model will provide outcome payments at four, 12 and 26 weeks to ensure job seekers are supported to take up all work opportunities, including seasonal work. “Real jobs – albeit of a short duration – provide a break from welfare, as well as assist job seekers into more permanent positions,” Senator Abetz said. “Data tells us quite clearly that those that have undertaken a few short-term employment opportunities are substantially more likely to gain permanent positions. “The new model includes wage subsidies to support the employment of young job seekers, Indigenous job seekers, the long-term unemployed, the Restart subsidy for older workers, as well as the Government’s Relocation Assistance, which is helping people move to take up a job. “Work for the Dole will be rolled out nationally to help job seekers to learn new skills and remain socially active and engaged while looking for work. Work for the Dole allows job seekers to show that they are keen and willing to work while also giving something back to the community that is supporting them. “The new jobactive system will ensure that job seekers receive the practical help they need to move from welfare to work, and that employers are being sent candidates that have the skills and attitudes that meet their business needs. Assistant Minister for Employment Luke Hartsuyker said there had been strong interest in the Government’s new employment services model and 184 organisations had submitted a tender. The competitive tender process was conducted by the Department of Employment in accordance with the Government’s procurement rules and signed off by an external probity adviser. “The 66 organisations that have been offered contracts were selected on the basis of their capacity to deliver services that will meet the needs of local job seekers and employers, their past performance in service delivery, the strength of their management teams and their governance structures,” Mr Hartsuyker said. “The Government was conscious of the need to move the employment services sector to a more competitive and sustainable basis, while at the same time ensuring an appropriate mix of organisations on the ground. “An important change is that we are offering five-year contracts instead the current three years, which will give more certainty for all concerned. “I am delighted to see that there will be a strong mix of for-profit and not-for-profit organisations delivering services to job seekers and employers. “New partnerships and sub-contracting arrangements have been formed, allowing organisations to pool resources and expertise to best meet the needs of local job seekers and employers. “Organisations have also proposed a number of innovations to assist job seekers and employers, such as the greater use of technology, extended opening hours, dedicated points of contact for employers, and specialist staff to meet the needs of Indigenous job seekers, youth and people with a disability. •	five organisations have been offered contracts to deliver the Harvest Labour Services and one organisation the National Harvest Labour Information Service to connect job seekers to harvest work opportunities. In coming months, job seekers will receive advice on which organisation will assist them with their job search after 1 July 2015. In the meantime, job seekers should continue to work with their existing Job Services Australia provider. Likewise, successful organisations that have a need for staff may record details of job opportunities on the site. March 30, 2015 - Scientists have recently discovered a link between inflammation and depression, which affects approximately 148 million people in the United States. A new study finds that resveratrol -- a natural anti-inflammatory agent found in the skin of red grapes -- can prevent inflammation as well as depression-related behaviors in rodents exposed to a social stress. "Our research is very relevant to today's society because it investigates potential treatments for people with an increased susceptibility to depression and related disorders that arise due to social stress," said Susan K. Wood, Ph.D., assistant professor at the University of South Carolina School of Medicine and leader of the research team. "We hope our findings will encourage scientists who are running clinical trials to test the effectiveness of natural anti-inflammatory agents on depression, which is currently an understudied area." Some psychiatric disorders are known to arise from a social stress, such as bullying or the loss of a loved one. In previous research, Wood's team developed an animal model for this type of social stress in which a larger, more aggressive rat takes on the role of a bully. Some rats exposed to the bullies developed both depressive-like behaviors and inflammation while the rats that did not develop depressive-like behaviors showed no inflammation. In the new work, the researchers repeated their experiment with one key difference: the bullied rats were given a daily dose of resveratrol roughly equivalent to the amount found in six glasses of wine. They found that resveratrol blocked the increased inflammation in the brain and also prevented the depressive-like behaviors in animals that would have normally developed those behaviors. "Resveratrol appears to knock down inflammation throughout the body," said Julie Finnell, a doctoral student in the research team who will present the findings at the American Society for Pharmacology and Experimental Therapeutics (ASPET) Annual Meeting during Experimental Biology 2015. "We found that administering resveratrol blocks the inflammation we would normally see in animals undergoing the bullying stress and brings it to control levels. We saw that consistently with IL-1ß [a pro-inflammatory protein] and many of the other inflammatory markers that we analyzed." In addition to being naturally present in the skin of red grapes and in red wine, resveratrol is also sold as supplement. Studies have shown that the natural agent might be responsible for red wine's ability to prevent blood vessel damage and reduce LDL cholesterol, and experiments using high doses of resveratrol in animals have suggested it might help protect from obesity and diabetes. Wood said the group's findings are exciting because they show that resveratrol has anti-inflammatory potential in the brain, not just on levels of inflammation circulating in the body. "Certainly, there is a strong case being built now between clinical and preclinical work that inflammation is linked to depressive symptoms, and there is a great need for these findings to be validated in human studies," she said. The above story is based on materials provided by Federation of American Societies for Experimental Biology (FASEB). I happened to be making a timelapse of the Milky Way rising over Uluru the other night on March 17th when the strongest geomagnetic storm of this 11 year solar cycle hit. It is nearly impossible to see the aurora from this latitude and I happened to be pointing my camera and the south celestial pole and managed to capture it right next to Uluru! Truly magical! How would Australian soldiers, political leaders and the media have tweeted the Anzac experience if they had social media? Imagine the landing at Gallipoli reported by uncensored social media, where soldiers, officers, nurses and the media report what they see, think and feel. The ABC invited the National Library of Australia, along with the Museum of Australian Democracy and the Australian War Memorial to contribute our primary sources from our First World War collections to their ABC Gallipoli Twitter Project. The project, developed along with Twitter Australia, stems from one central Twitter account—@ABCNews1915—and represents the twitter accounts of over 60 First World War personalities from April 1915. The accounts will tweet in ‘real time’, from historical records of the thoughts and comments from those who were at Gallipoli 100 years ago. Walter Kudrycz, our First World War historian who recently worked with us on our current exhibition, Keepsakes: Australians and the Great War, sourced quotes from Sir John Monash’s personal diary, Joseph Beeston’s manuscripts and albums, and Merv Higgins’ letters primarily to capture moments from April 1915. We also provided snippets from cablegrams from King George V, images from Beeston’s albums and quotes from General William Bridges. The project uses the strengths of our national collections to be a voice—for those who no longer can tell the story of Gallipoli—to a contemporary audience. These uncensored personal reflections were touching to collate and explore more than the fight, but also the boredom, the humour and the wait. Follow @ABCNews1915 on Twitter from April 1 to experience Gallipoli 100 years on. Advancing Australia. How will we fare in the next 40 years? A talk by Dr. Karl on the challenges and opportunities of Australia from the 2015 Intergenerational Report. Australia has lost a cultural icon and a leading figure of our arts sector with the passing of Mrs Betty Churcher AO FAHA. Mrs Churcher was the first woman to become director of the National Gallery of Australia where, between 1990 and 1997, she significantly reshaped the gallery and expanded its profile through a series of blockbuster exhibitions as part of her vision to increase access to the visual arts. Mrs Churcher will be most remembered for bringing a vivid appreciation and enthusiasm for art to the wider Australian community. The National Gallery, and indeed Australian audiences, benefited from Mrs Churcher’s passion and leadership which included the expansion of the Gallery’s collections and the development of new gallery spaces. Under her directorship, the Gallery was rewarded with the confidence of international collecting institutions to share their collections for display in Australia. Mrs Churcher was also a strong advocate for the display of Australian art internationally. Widely admired by her peers, staff and patrons of the National Gallery, Mrs Churcher was a beloved figure to many Australians through her generous sharing of her incredible knowledge and passion for the visual arts. Mrs Churcher was awarded an order of Australia in 1990 for her services to the arts, particularly in the field of arts administration and education and in 2009 was awarded a Visual Arts Emeritus Medal by the Australia Council for the Arts, for her contribution to the understanding and appreciation of the visual arts by all Australians. I extend my condolences to Mrs Churcher’s family and friends. Sydney is on track to become the first city in Australia to reach five million people, according to data released today by the Australian Bureau of Statistics (ABS). In 2013-14, Sydney's population increased by 84,200 people to hit 4.8 million, however Melbourne is closing the gap. It had the largest population growth of all capitals, increasing by 95,700 people (or 1,800 people per week) to reach 4.4 million. But neither city can lay claim to being the fastest-growing capital in Australia. That title is currently held by Perth, which grew by 2.5 per cent in 2013-14, to become our fourth capital city to hit 2 million people. Phil Browning from the ABS said this was a significant milestone, given just 30 years ago Perth's population lagged behind that of Adelaide. "In 1983, Adelaide just beat Perth to the one million mark." said Mr Browning "However, since that time, Perth's population has more than doubled, whereas Adelaide has grown by less than one third." "Adelaide’s population increased by 1 per cent in 2013-14 with only Hobart (0.6 per cent) having a slower rate of population growth." Darwin’s population increased by 2.2 per cent in 2013-14, giving it the second-fastest growth rate of all state capitals (along with Melbourne). Brisbane’s annual growth rate has fallen to its lowest level in over a decade (1.7 per cent), but it is still growing faster than Canberra (1.2 per cent). Capital city growth was responsible for almost 80 per cent of Australia's population growth in 2013-14, with much of this growth occurring in outer suburban areas and inner cities. Seven of the country’s top ten growth areas were outer suburbs of Greater Melbourne, with South Morang having the largest growth of all areas in Australia, up by 4,200 people. The suburb of Crace, on the ACT's northern outskirts, holds the title of Australia's fastest-growing area, with a 57 per cent increase in population in 2013-14. For further information on capital city and regional population change, see Regional Population Growth, Australia (cat. no. 3218.0) available for free download from the ABS website http://www.abs.gov.au. The National Children’s Commissioner, Ms Megan Mitchell, has launched a document that takes another significant stride for the development of the rights of children. Supporting young children’s rights: statement of intent (2015—2018) was developed by Early Childhood Australia (ECA) and the Australian Human Rights Commission. It highlights the central role of children’s rights for quality teaching and learning. Speaking in Brisbane, at the Lady Gowrie Love Street Community Kindergarten, Commissioner Mitchell said the statement of intent highlights the central role of children’s rights in providing quality teaching and learning. "The early years are critical for laying the foundations for the sound development of a child. Building a strong foundation in supporting the rights of children in the early years increases the probability of positive outcomes," Commissioner Mitchell said. ECA chief executive Sam Page said the report provides practical information for young children, educators and families. "The statement is designed to support teachers, educators, the community, families and children to ethically and authentically support the rights of children in early childhood; to understand and implement child rights education in early childhood education and care settings, and to advocate for children’s rights," Mr Page said. Dr Renee Horton is the Lead Metallics and Weld Engineer for NASA’s Space Launch System at the Michoud Assembly Facility. March 30, 2015 - Stalagmites, which crystallize from water dropping onto the floors of caves, millimeter by millimeter, over thousands of years, leave behind a record of climate change encased in stone. Newly published research by Rhawn Denniston, professor of geology at Cornell College, and his research team, applied a novel technique to stalagmites from the Australian tropics to create a 2,200-year-long record of flood events that might also help predict future climate change. A paper by Denniston and 10 others, including a 2014 Cornell College graduate, is published this week in the journal Proceedings of the National Academy of Sciences. The article, "Extreme rainfall activity in the Australian tropics reflects changes in the El Niño/Southern Oscillation over the last two millennia," presents a precisely dated stalagmite record of cave flooding events that are tied to tropical cyclones, which include storms such as hurricanes and typhoons. Denniston is one of few researchers worldwide using stalagmites to reconstruct past tropical cyclone activity, a field of research called paleotempestology. His work in Australia began in 2009 and was originally intended to focus on the chemical composition of the stalagmites as a means of reconstructing past changes in the intensity of Australian summer monsoon rains. But Denniston and his research team found more than just variations in the chemical composition of the stalagmites they examined; they discovered that the interiors of the stalagmites also contained prominent layers of mud. "Seeing mud accumulations like these was really unusual," Denniston said. "There was no doubt that the mud layers came from the cave having flooded. The water stirred up the sediment and when the water receded, the mud coated everything in the cave -- the floor, the walls, and the stalagmites. Then the stalagmites started forming again and the mud got trapped inside." The stalagmites were precisely dated by Denniston, Cornell College geology majors, and Denniston's colleagues at the University of New Mexico. Once the ages of the stalagmites were known, the mud layers were measured. Angelique Gonzales '14, who worked with Denniston on the research and is third author on the paper, examined nearly 11 meters of stalagmites, measuring them in half millimeter increments and recording the location and thickness of mud layers. This work gave the team more than 2,000 years of data about the frequency of cave flooding. But the origins of the floods were still unclear. Given the area's climatology, Denniston found that these rains could have come from the Australian monsoon or from tropical cyclones. "We were sort of stuck," Denniston said, "but then I started working with Gabriele." Gabriele Villarini, an assistant professor of engineering at the University of Iowa and the second author of the paper, studies extreme meteorological events, what drives the frequency and magnitude of those events, and their impact on policy and economics. With Denniston and Gonzales, Villarini examined historical rainfall records from a weather station near the cave. "The largest rainfall events, almost regardless of duration, are tied to tropical cyclones," Villarini said. Next, they compared flood events recorded in a stalagmite that grew over the past several decades to historical records of tropical cyclones. This analysis revealed that timing of flood events in the cave was consistent with the passing of tropical cyclones through the area. 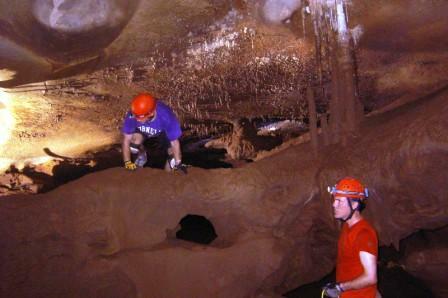 Thus, the researchers interpreted the flood layers in their stalagmites largely as recording tropical cyclone activity. The resulting data tell scientists about more than just the frequencies of tropical cyclones in one part of Australia over the past 2,200 years. A major driver of year-to-year changes in tropical cyclones around the world is the El Niño/Southern Oscillation, which influences weather patterns across the globe. During El Niño events, for example, Australia and the Atlantic generally experience fewer tropical cyclones, while during La Niña events, the climatological opposite of El Niño, the regions see more tropical cyclones. "Our work, and that of several other researchers, reveals that the frequency of storms has changed over the past hundreds and thousands of years," Denniston said. "But why? Could it have been due to El Niño? Direct observations only go back about a hundred years, and there hasn't been much variation in the nature of El Niño/Southern Oscillation over that time. Further back there was more, and so our goal was to test the link between storms and El Niño in prehistory." Denniston noted that the variations over time in the numbers of flood events recorded by his stalagmites matched reconstructed numbers of hurricanes in the Atlantic, Gulf of Mexico, and Caribbean. "Tropical cyclone activity in these regions responds similarly to El Niño, and previous studies had also suggested that some periods, such as those when we had lots of flood layers in our stalagmites, were likely characterized by more frequent La Niñas. Similarly, times with fewer storms were characterized by more frequent El Niños." The results of this study mark an important step towards understanding how future climate change may be expressed. "It is difficult to use climate models to study hurricane activity, and so studies such as ours, which produced a record of storms under different climate conditions, are important for our understanding of future storm activity," Denniston said. Gonzales, who is planning to pursue a Ph.D. in geology, said that her experience with Denniston and his research, including two senior seminars and an honors thesis, was valuable because she got both field and lab experience as she helped determine not just what had happened in the past, but what that meant. "There were a lot of different aspects to put this together -- dating, measuring, literature review, and modeling," she said. "It was really exciting." Denniston is now gearing up to establish a detailed cave monitoring program in this and other regional caves. "We want to extend this study," he said, "to examine what conditions trigger cave flooding." In addition to Denniston, Villarini, and Gonzales, the other authors on the paper were Karl-Heinz Wyrwoll from the University of Western Australia, Victor J. Polyak from the University of New Mexico, Caroline C. Ummenhofer from the Woods Hole Oceanographic Institution, Matthew S. Lachniet from the University of Nevada Las Vegas, Alan D. Wanamaker Jr. from Iowa State University, William F. Humphreys from the Western Australian Museum, David Woods from the Australian Department of Parks and Wildlife, and John Cugley from the Australian Speleological Federation. The disability employment market is now open for business as part of the Government’s commitment to helping people with disability find jobs. “For the first time ever, all Disability Employment Services (DES) are now being delivered through competitive contracts by providers who have demonstrated their ability to help people with disability find and keep a job,” Minister Fifield said. In May 2014, the Australian Government announced that the 47% of Disability Employment Services delivered by CRS Australia – totalling more than $141 million a year – would be thrown open to the non-government sector via a competitive tender arrangement. “The non-government sector has shown that it can effectively deliver improved employment outcomes for people with disability,” Minister Fifield said. The successful non-government organisations started delivering disability employment services from December last year, with CRS Australia closing completely last month. “This measure is all about giving job-seekers with disability confidence that their DES-DMS provider has demonstrated their ability to achieve high quality employment outcomes and that they therefore have the best chance possible of finding and keeping a job.”. “These high performing organisations are able to get people into employment and help them manage their disability, injury or health condition while working,” Minister Fifield said. Minister Fifield said that almost 21,000 people with disability have been transferred to a successful service provider who will continue to support them to find employment or help them maintain employment. In connection with the Australian Network on Disability, the Government has hosted a number of Business Roundtables this month to focus on the barriers businesses face in employing a person with disability, and where the current system does not meet their needs. “People with disability want to work. But we cannot improve employment opportunities for people with disability if we don’t have a system that supports both job seekers and employers,” Minister Fifield said. Overwhelmingly I have been told that unless the system is built to work for business, it won’t work for people with disability,” Minister Fifield said. Disability Employment Services in Australia are currently assisting over 165,000 people with disability into employment and have placed over 243,000 people into jobs since it began. Disability Employment Services – Disability Management Service providers help people –many of whom have acquired a disability, injury or health condition – get back on track and into work. They help employers with recruitment, workplace modifications, training and ongoing support. Further details of local Disability Employment Service providers are available online at www.jobaccess.gov.au.